I noticed that Mikezilla's Estoc Wars Guide needs an update. This guide will teach you guys general and more advanced facets of Estoc Wars. There are 3 main types of wars players can sign up for. Individual: Players sign up via their profile page, and are placed in a clan with stats that are comparable to theirs. This is the only war in which there is a guarantee that you will war. Round: Players sign up by casting Wave of Conflict. Usually, they are organized into war clans with specific rosters set up. Unfortunately, this type of war is dying because of shadow hansel clans. Classic: You come up from KO after 10 minutes. Advantage: You come up on a time of your choosing, between 7-13 minutes of being KO'ed. Random: You come up at a random time between 5-10 minutes of being KO'ed. So, for example, if someone tells you they are in a primal advantage war, they mean they are in a war that has a 7-13 minute knockout window with bfa/bfe disabled. You must have 14 mithril and 1 crystal to compete in these wars. 14 mithril casts all the spells that enhance your stats, and the health crystal regenerates your army for a strategic surprise attack in the middle of the war. Also, watch clan chat for special notes by your wc and tracker. General preparation is very valuable, but trackers and war commanders both are especially crucial to a war's success. Therefore, their preparation is vital to the war cause. 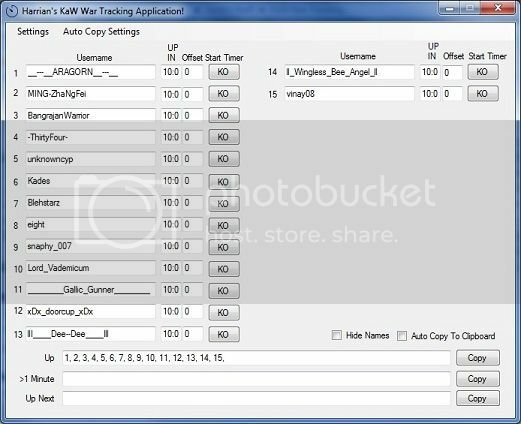 Download a tracking program. 2 programs publicly available on KAW forum are Harrian’s program and Vadue/HTLFreak’s program. 1. The tracker should prompt you to tell it how many are warring in the enemy clan. 2. 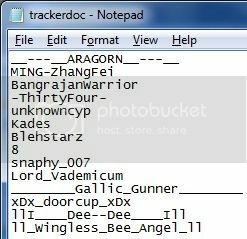 Fill in the clan roster names and numbers of the players in the enemy clan. 3. You can fill in custom message prefixes (for when you auto generate the messages) and fill out the maximum and minimum KO times (for random and advantage wars). 1. Generally, there will be a spreadsheet that the clan will collaborate to fill out about the opposing side and your side. 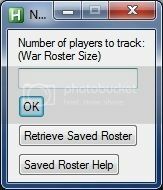 The spreadsheet will include the usernames of both war rosters and their corresponding stats. 2. Using the spreadsheet, the WC will create a brief that includes individual targets for every member that is warring and general strategy. Generally, wc's use your clan roster number to refer to you and who you will be attacking. For example, "17 dump troops and attack 18 to ko" means clan roster number 17 of your clan should dump their troops and attack the enemy clan roster number 18. Classic: Usually, you will want to have your team assassinate and scout bomb at the beginning rather than plunder. This way, you will gain control of the war and be able to pin the enemy when they come up after 10 minutes of being down. Advantage: In these types of wars, there is no "control" because of waves, so the strategy is to plunder hard and self knockout. However, if you are very confident in your team's ability to get repins, you can tank and spam the other team until they come up. Random: Usually, you use about the same type of strategy you use in classic wars, gain control, and spam the 5-10 minute window. Your ally, Bob, has knocked themselves out, losing 4,000,000 gold of their plunder score. Your enemy, Jill has knocked out your ally, Bob, looting 20,000,000 gold of their plunder score. Your enemy, Jill, has knocked themselves out, losing 30,000,000 gold of their plunder score. Your ally, Bob, has knocked out your enemy, Jill, looting 400,000,000 gold of their plunder score. At the beginning of the war, hit the targets that the WC told you to hit during the brief before the war. Once they are knocked out, watch the tracker for targets that are up and hit them. If necessary, knock yourself out to minimalize your plunder loss. After this, just follow the instructions of your WC and Tracker. During primal wars, hansels should not use attack pots in order to unload their troops faster and avoid being plundered on (their troops make too little plunder to affect the war outcome). Unless otherwise stated by your war commander, when you come up, unload troops first in order to avoid being attack-knocked-out (enemy receives higher plunder than all other knock-out methods). Always watch clan chat. 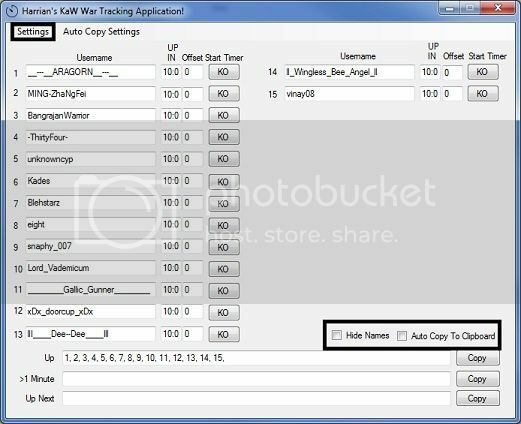 Very important information is there, ranging from reported enemy crystal uses to wave/crystal times to the tracker. An easy way to knock yourself out and avoid the server lag is to fail a steal. This kills the most amount of spies and therefore knocks you out the fastest. During classic wars, control is key. Watch the <1 minute messages that are posted by your tracker in order to repin the enemy and keep control. During advantage/random wars, always report ups in clan chat. Assassinates are the most effective action in war; they reduce enemy spies and troops. Usually, when you want control, use assassinates. PS1's and Hansels should never carry attack defense pots. The enemy gains more plunder off of them and they have little to no effect on the success of people with high troop stats. If you have little/no towers on troops/spies (especially primals) SELL your defense pots for that category. It is easy to plunder on attack/defense pots. Usually, I check the bottom 2 boxes. This hides the names of the opposing clan members so only clan roster numbers are showing. Also, auto copy is very useful when you are currently up and need to put targets in clan chat fast. The settings are very self explanatory. When you see the opposing member get knocked out, hit the KO button next to their name, and the timer does the rest. In the top left, you can search players by name or clan roster number. 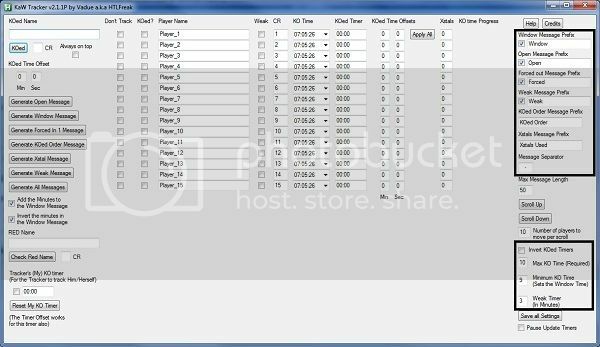 Check the KO boxes to reset the KO timers on the players. Below the search is the auto-generate message buttons. Use these to automatically copy to your clipboard and use CTRL+V and paste the auto-generated message in clan chat. Use the crystal box to keep track of who on their team has used a crystal. If you need any other help, press the help box up top. This is not a thing that can be taught, this has to be learned from experience. For example, if your clanmates are dropping like flies and the other team has control, you need to be able to appropriately time a crystal wave to bring them down. That timing comes from experience of being in a war; there is no precise way to teach this. Do not have your tanks unload. Have them stay up and annoy the other team by skimming their tanks. Also, have your tanks report their troop/spy % in clan chat every so often. This way, if they are low and are about to get knocked out, you can tell them when to use a crystal to avoid being knocked out. If your team is down by a significant amount and the time is winding down, have your team steal and attack to earn plunder. Also, if your team is trying to hold a lead and there is little time left, have them dive to keep from being plundered on. There are many various situations like this, just use logic. Dump: To get rid of troops or spies, usually by failing. Dive: To get rid of one's troops and spies, plundering very quickly and Self-Knocking-Out and minimize plunder loss. Inc: Incoming, means a player is receiving actions from an opposing player. Regen: Regenerate, or wait 5 minutes for your troops/spies to gain more units and become stronger. SKO: Self knockout or steal knockout, depending on which context it is used in. SS: Spreadsheet, or screenshot, depending on the context of the statement. Sweep: To perform actions on everyone on the opposing war roster in an attempt to see if anybody has crystalled. Tank: (n)A build with a very large amount of attack defense towers and spy defense towers. 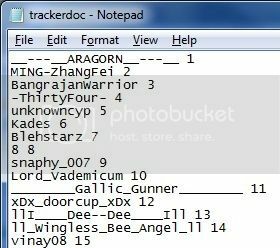 Tank: (v) To attack/assassinate twice from full troops/spies and then attacking once per regeneration period (assuming you are receiving incoming). Wave: During an advantage war, a team comes up at around the same time and Self-Knocks-Out at about the same time. Last edited by IllIll_BlackHandLegion_IllIlI on May 28 2015, 8:39pm, edited 8 times in total. I didn't know I asked for support. Well thought out and very informative. Should help a lot of people out. This is the best guide I have ever seen. Great job and I hope this gets a sticky asap. Can you recommend an sko school?